5G networks are anticipated to be soft, green, and super-fast. They are expected to deploy in the 2020s to satisfy the challenging demands of mobile communication. After several years of worldwide pursuit of 5G solutions, the campaign on 5G standards has just begun. Characterised by a mixed set of KPIs like data rates, latency, mobility, energy efficiency, and traffic density, 5G services demand a fundamental revolution on the end-to-end network architecture and key technologies design. At this mid-point of the 5G journey, we need to ask: are we on the right track to provide 5G solutions? 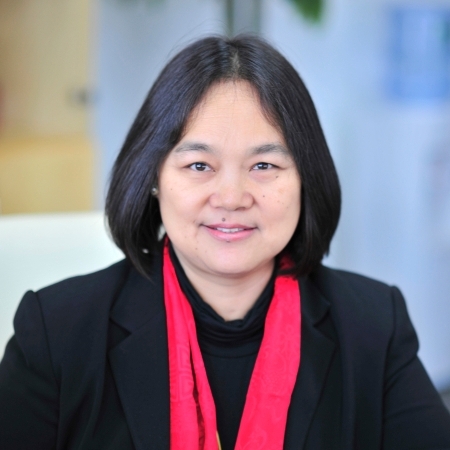 Our speaker is Dr Chih-Lin I, who has over 30 years experience in wireless communications and is currently Chief Scientist of Wireless Technologies at the China Mobile Research Institute. Dr I will give a comprehensive overview of China Mobile?s 5G solutions, including an end-to-end network architecture with User Centric Network and Soft Defined Air Interface and the corresponding enabling technologies like C-RAN, NGFI, MCD etc presented as imperative solutions for diversified set of usage scenarios. She will also talk to China Mobile's views on standardisation timeline and work scope, spectrum strategy, prototyping and field trial plans. This is a free MNSI public lecture advertised for the interest of TelSoc members. This is not a ticketed event, but attendees should register to secure a seat. Dr Chih-Lin I is the Chief Scientist of Wireless Technologies at the China Mobile Research Institute. Chih-Lin I received her PhD in electrical engineering from Stanford University and has almost 30 years experience in wireless communications. She has worked at various world-class companies and research institutes, including the Wireless Communication Fundamental Research Department of AT&T Bell Labs; the headquarters of AT&T, as Director of Wireless Communications Infrastructure and Access Technology; ITRI of Taiwan, as Director of Wireless Communication Technology; Hong Kong ASTRI, as Vice President and Founding Group Director of the Communications Technology Domain. She received the IEEE Transactions on Communications Stephen Rice Best Paper Award and is a winner of the CCCP National 1000 Talent program. Currently, she is China Mobile?s Chief Scientist of wireless technologies in charge of advanced wireless communication R&D efforts of the China Mobile Research Institute. She established the Green Communications Research Center of China Mobile, spearheading major initiatives including 5G key technologies R&D; high energy efficiency system architecture, technologies, and devices; green energy; and C-RAN and soft base stations. She was an elected Board Member of IEEE ComSoc, Chair of the ComSoc Meetings and Conferences Board, and Founding Chair of the IEEE WCNC Steering Committee. She is currently an Executive Board Member of GreenTouch and a Network Operator Council Member of ETSI NFV. Her research interests are green communications, C-RAN, network convergence, bandwidth refarming, EE-SE co-design, massive MIMO, and active antenna arrays. This a FREE public event.